Take a recognizable tumbler quilt design and turn it on its side. Combine several sizes of tumbler shapes and presto, you have a modern quilt design that breaks most sewing rules. This week’s Sewing With Nancy features two traditional quilt designs that are sewn in columns, not rows. Plus the piecing is super-simple. This is the second episode of Quick Column Quilts. I hope you’ll enjoy creating your next quilt with the Grandmother’s One Patch Template, create hexagon designs with ease. Watch online at NancyZieman.com. The first quilt of this episode is called Tumbling Tumblers. Transform a design, traditional to modern, with a simple turn of the design. The tumbler template from the Trace ‘n Create Grandmother’s One Patch Template is used to create this quilt design. There are four sizes of tumbler shapes—4″, 6″, 8″, and 10″ in one template. All four sizes are traced on the fabric and then cut, using a ruler, rotary cutter, and mat. The tumbler shapes are stitched together using traditional quilting techniques. Multiple background colored tumbler shapes are sewn together to add negative space to the design. Negative space is the new buzz word in quilting, and it references the space around the quilt design, not the design itself, which forms an interesting or artistic look. You can see how the rest of the quilt is created while watching the TV show or see all the dimensions detailed in the book, Quick Column Quilts. At first glance, hexagon shapes cause many quilters to think, Oh no, the dreaded Y-seam! Not so with this speedy column quilt design. The hexagon shapes are created with two halves, eliminating the intersection of three seams, otherwise known as Y-seams. With this technique, faux hexagon halves are stitched in columns with relative speed and ease. Plus, the results are dramatic. The second template in the Grandmother’s One-Patch Template set, the faux hexagon, is used for this project. Four fabrics are traced and cut from the faux hexagons, plus the background fabric, which again creates the negative space design element. This photo was taken during my design process. Notice my design sketch—elementary! The faux hexagons are sewn together with straight seams. No Y-seams in this column quilt project. Then, the columns are sewn together. That’s it—all straight seaming. Full details, are in Quick Column Quilts Part Two. 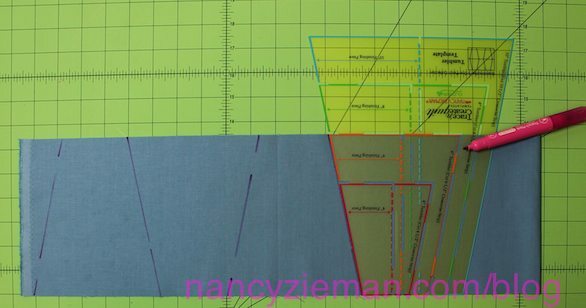 Watch Quick Column Quilts (Part One, Part Two, and Part Three) on Sewing With Nancy online. I was immediately drawn to the Tumbling Tumblers Quilt. I really like how you used background fabric to create the negative space to make the tumblers seem more random rather than a straight row of tumblers. Neat effect! Thanks for your creativity! I was immediately drawn to the “hit and Miss” table runner…love anything hexie! I like the tumbling tumblers quilt the best. I liked the hit and miss table runner. The quilting took it to the next level. I like the Tumbling Tumbler quilt, making it in colors from my stash. Two of my three daughters like modern looking quilts, and Tumbling Tumblers would enhance their living space. I like the hexie table runner it has a modern look. I really like the faux hexagons in the Hit and Miss table runnerc and can’t wait to try it for myself. Like the Tumbling Tumbler best. Love both, but if I had to choose just one it would be the table runner. I really like both the quilt and the tablerunner. Thanks for the wonderful giveaway. The Hit and Miss Table Runner is my favorite. No Y-seams! Thanks for sharing this great technique. I love the idea of half-hexis. Making that with the template would be do-able for me. As much as I like the hexagon, I would never tackle it the traditional way. I like the hit and miss tumbler table runner. Can’t make up my mind. I would like to make both! The Hot and Miss is very nice. I think our grandmothers and greet grandmothers would enjoy the new versions of their quilts. I REALLY LIKE THE “HIT AND MISS QUILT”. IT IS UNIQUE AND THE METHOD OF CONSTRUCTION LOOKS EASY. I TEND TO SHY AWAY FROM THOSE “Y” SEAMS. Gosh, just a hard question. I think I like the Hit and Miss table runner. The hexagons look pretty easy to make. I do like the Tumbling Tumblers also, such a hard decision. I choose the Hit and Miss table runner. Hit and Miss is very modern and cool! Really like the Hexie table runner. I like the look of the tumbling blocks quilt. I like the Tumbling Tumbler quilt. I think you can really change the look by the choice of solids or prints. The Hit and Miss Table Runner is my favorite. I would definitely like to use the pattern to make a quilt. Already planned to make Tumbling Tumblers but no must add Gram’s One-Patch as well because of the easy hexi method! My favorite is the Hit and Miss. I would love to work the hexagons with straight seams. Amazing!!! I like the Hit and Miss table runner. I love the look of the hexagons and half hexagons. The quilting is beautiful too. Would love to make this one. I love the tumbler quilt ad would so love to win this book. I am in love with the faux hexagon quilt. It looks super hard all put together, but in reality, it is a cinch to make! I keep saying I need to make a hexi quilt and this could do it for me. I love the design and I’d want to copy the quilting too. Thanks. I like the tumblers best. It’s another great way to use the Grandmothers One-Patch templates I already have. Would love to win the book. Thanks Nancy! I like the hexie runner which would make a pretty baby quilt in a larger size! Think I like the hexie one although the two sizes of the tumblers blocks makes for an interesting design. Both merit a second look! I like the Hit and Miss Table Runner. It would be my first project from the book before attempting a large quilt. I like the Tumbling Tumblers and would love to win this book. Thank you. I am crazy about the tumbler quilt ,I even bought the template would love to have new book. Your tutorial makes hexagons seem possible! I think the hexie quilt is quite clever. I have a half hexie template and you have given me a new way to use it! Thanks! I’d love to try the hexagon runner- great without the Y seams! Would make a cute baby quilt if expanded too. I love the Hit and Miss table runner! I was also so thrilled to meet you at Crystal Bridges last year when I was working there and you visited. I apologize but I was so awestruck I was speechless! I like them both but especially the half hexie The best! I also love your tutorials and ring binder books you print. I have your “Hot and Handy Projects book, your Handbag Sewing Techique with DVD,and Sew Simple Retangles an Squares with DVD.”These are great to read when you sit down in the evening to rest and they lay flat while I sew. I’m working on the 60 Minute Pot Holder in the “Hot and Handy Projects” book. There’s so many wonderful ideas in it! I can’t make things fast enough! Thank you for all you teach me Nancy!!! Love them both! I guess Tumbling Tumblers would be my pick if I have to choose…but don’t make choose!!!! I watched all three episodes and the one I like best is the Wind Chime quilt. I’m new to quilting and would love to try that one or even the Tumbling Tumblers. I really like the Tumbling Tumblers Quilt. It’s modern but doesn’t look too difficult to make. I am just about to do a Half Hexi quilt for a friend. This is a very timely presentation. The Hexi blocks are very intriguing, so I’d pick them as my favorite. The hexie quilt is great – lots of movement. I am a sucker for hexies. I like the large sizes in this table runner. Hit and miss, hexagon is a shape I have not yet used in any quilt I have made to date. It’s on my bucket list! I really like the Tumbler Quilt ! The Tumbler quilt is my favorite…I like the varying sizes in the pattern. I like the half-hexi, not only because of the easy way the hexagons are produced, but also because of the element of surprise of the halves without the matching part. Hit and Miss is very cool. I would love to try the tumbler quilt. I love the hexagonal quilt. The hexagons give the illusion of curves despite the columnar nature of the quilt. I am a sucker for curves. Even my garden has no straight line beds in it! No Y seam…what a great concept! The half hexi is one l’d love to try. I love both quilts but find the hexagons particularly appealing. I’ve made a couple of traditional hexagon quilts but found them very slow-going. I can’t wait to do one with the half-hexis. I like the tumbler quilt best. Love the half hexi. No y seams. Ez! It’s hard to choose, but I like the Tumbling Tumbler quilt the best. I like the use of modern piece placement.